Last month's suicide bombing at an Ariana Grande concert in Manchester wasn't the first time an Islamist terrorist targeted young people out for a night of fun. In 2001, a Hamas-affiliated terrorist blew himself up outside the Dolphinarium, a Tel Aviv nightclub, killing 21 Israelis, including 16 teenagers. The Times commits minimal attention to attacks on Israelis today. Last Friday's fatal stabbing attack in Jerusalem received a scant 431-word article containing no images or references to "terror," "terrorist," or "terrorism." 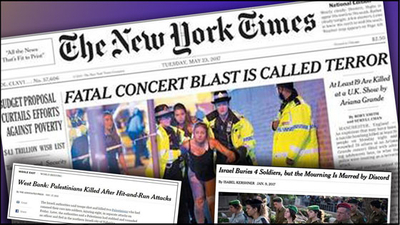 Worse, the newspaper ran a 243-word Associated Press article about the attack with a headline emphasizing the terrorists' deaths, rather than their victim: "Palestinian Attackers Killed After Killing Israeli Officer." By contrast, the Times provided much more sympathetic coverage to an April terrorist attack in Paris that similarly claimed a police officer's life. At 1,037 words, the article was almost three times as long, contained six photos of the attack scene, and referred six times to "terrorism" and thrice to "terrorist attack." An attack's location plays a significant role in determining the extent of news coverage. Commentator Joe Concha calls this the "there versus here" phenomenon. For example, the Times published eight articles about last November's car ramming and stabbing attack at Ohio State University that killed no one, but injured 11 people. That included a profile of the suspected terrorist behind it. Deadlier attacks overseas generally receive far less coverage. However, that "there versus here" explanation falters when comparing vehicular attacks in Israel with similar attacks in other non-US countries since Ohio State. The March truck attack in Westminster that killed five people generated 20 articles. December's Berlin Christmas market truck attack that killed 12 generated at least 50 articles. By contrast, January's truck attack in Jerusalem that killed four people generated just three articles and a mention in a daily news digest. 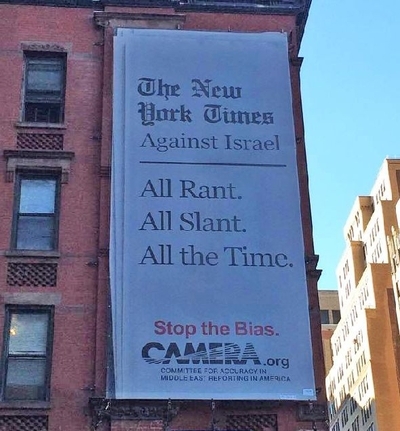 While some might point to the newspaper's April decision to hire pro-Israel columnist Bret Stephens as a sign of growing balance on the issue, subsequent coverage led veteran Times critic Ira Stoll to argue that the move just gave the paper cover to intensify its anti-Israel slant. Stoll lists five Times op-eds, each of which "taken alone, would be totally outrageous and indefensible. The onslaught of all five of them, in six weeks, constitutes an outbreak of anti-Israel and anti-Jewish hostility at the Times." The Dolphinarium attack, one of Israel's deadliest suicide bombings, marked its 16th anniversary on June 1. While it's too late for the Times to give due coverage to the 16 teens and five adults who were slaughtered, the paper conceded the parallels between their fate and that of the Manchester victims, by running this op-ed by a survivor of the Dolphinarium massacre expressing empathy for those affected by the Ariana Grande attack. However, when the Times published its May 23 editorial on the Manchester attack, it failed to mention the Dolphinarium attack, and thereby omitted the suicide bombing most similar to the Manchester attack in its targeting of children. The editorial duly notes how terrorists have shattered innocent lives, listing attacks in three European cities, but somehow forgets that Islamists have taken far more lives of Israelis "simply out enjoying themselves" than of all Islamist terror victims in Europe combined.